It invites participation from a largely amateur audience--those interested but not already in the club: If classical music's goal is to reach beyond its aging audience and seem more inclusive, this initiative does that by specifying that participants must be 14 or older and cannot have contractual obligations that would limit their participation, which means most professional musicians can't submit videos. It lets the audience self-identify: Once videos are submitted, anyone will be able to see which young performers had enough interest and talent to participate--a self-identified audience with clear interest. It turns its expertise over to the audience: Entrants get to practice and play with world-class experts, but ultimately, the amateurs will be the stars. That's a neat twist in which the amateurs become the sought-after group, rather than the experts. Where will you find yours? It creates a level playing field to encourage entries, using a new work written for the occasion. 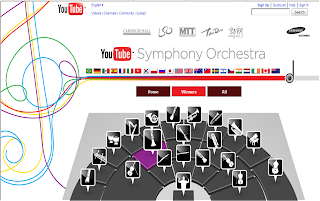 Entrants can download the score; access special videos already online from the London Symphony demonstrating master classes in various languages and for various instruments in the standard symphonic repertoire; listen to interviews and encouragement; play along while composer Tan Dun acts as your "personal conductor" for various instrument parts of the work; and access other types of support. It aims to generate new content, and, on the Web, content is king. The idea that there'll be new work, collaboration and an uncertain outcome adds drama and anticipation to this contest. As you think about adapting your expertise and opportunities into social media communications, keep this model in mind. I'm predicting the sweet sound of success.